Divide meat into two parts - the base and the filling. Put the other of the meat through a meat-grinder and combine well with sliced onions and spices. Rinse off the young grape leaves in cold water and place flattened on the work surface. Put a small amount of the meat filling in each leaf and secure roll with thread. Boil the dolmas in a separate pot. Prepare pilaff as per Kovurma Palov recipe above. Add dolmas to the pilaff after pouring water on sauteed meat and carrots. 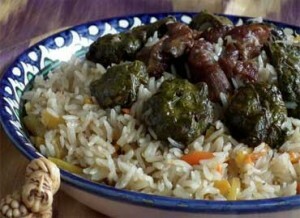 When ready, mix rice and serve in a mound on a large platter topped with dolmas.